Whether you’re an athlete, stay at home mom, or work at a job that can lead to overuse injuries, rapid healing is desirable as it minimizes pain and quickly restores function. Understanding the healing process is the KEY to knowing what therapeutic interventions to apply and when to apply them. The first stage of healing is inflammation. This is the body’s natural response to trauma. After an injury, the body attempts to achieve a state of homeostasis. Blood vessels constrict and seal themselves off as platelets create substances that form a clot and halt bleeding. Once homeostasis is achieved, blood vessels dilate, allowing nutrients, white blood cells, antibodies, enzymes and other beneficial substances into the affected area to promote wound healing and minimize the chance of infection. This phase is characterized by: Swelling, pain, heat and redness. In the second stage, the wound is rebuilt with new, healthy granulation tissue, aided by nutrients and oxygen. This new tissue is made up of a mixture of extracellular matrix and collagen, which allows for the development of a new network of blood vessels to replace the damaged ones. In addition, the body transforms damaged cells into fibroblasts, which are essential for collagen and new connective tissue formation. Maturation, or remodeling, is the last stage of the healing process. During this phase, the dermal tissues are overhauled to enhance their tensile strength. 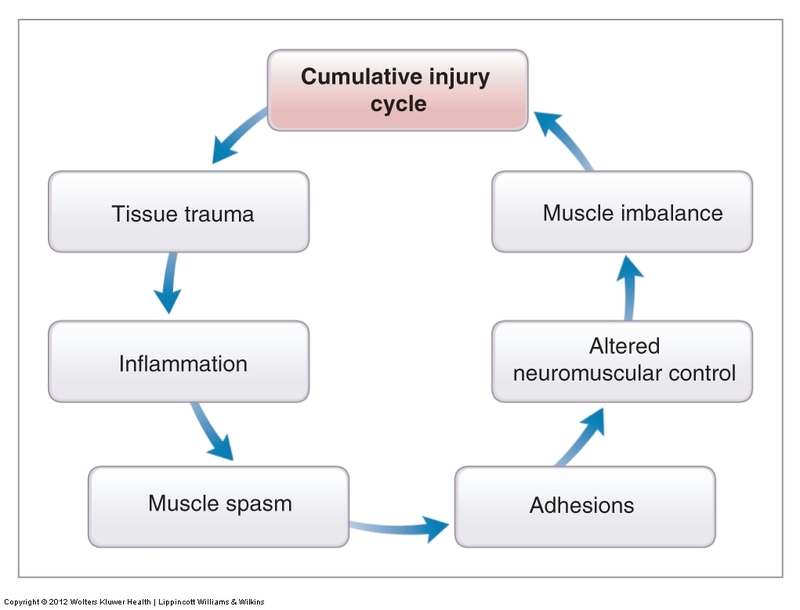 The Cumulative Injury Cycle illustrates how the body responds to an injury and what happens if the injury does not heal properly. The conventional approach or RICE (Rest, Ice, Compression and Elevation) may be counterproductive as it can delay or interrupt what the body is trying to accomplish. The potential negative effects of ice can be further compounded by adding NSAIDs, which block the healing process. Jones, M. K., Wang, H., Peskar, B. M., Levin, E., Itani, R. M., Sarfeh, I. J., & Tarnawski, A. S. (1999). Inhibition of angiogenesis by nonsteroidal anti-inflammatory drugs: insight into mechanisms and implications for cancer growth and ulcer healing. Nature medicine, 5(12), 1418-1423. The MEAT approach (Mobilise, Exercise, Analgesics and Treatment- SEE ABOVE) is the way to Rapid Injury Healing.